When I think of tremolo the first thing that comes to mind is the warm, tube driven “vibrato” from an old tube amp. With it’s warm swell, and round pulse, the tone of those amps are the epitome of the effect. 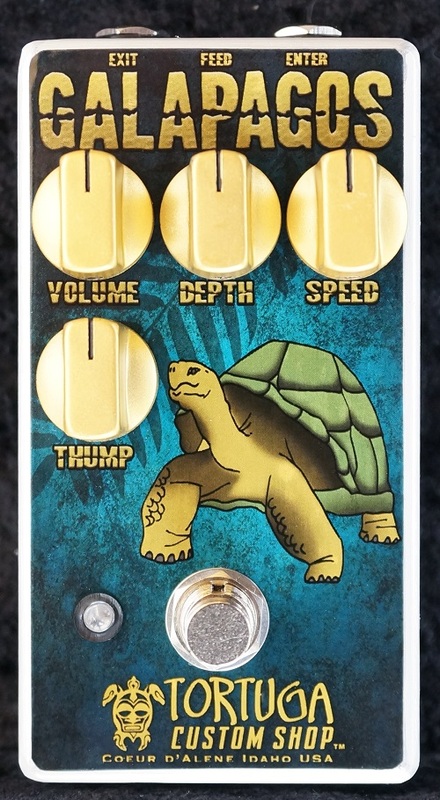 The Galapagos from Tortuga Effects doesn’t have switches for wave form or ramp or any of the bells and whistles that most players never use. Instead, the Galapagos was designed to emulate the beautiful, amp like sine wave pulse of those old amps with straightforward Volume, Depth and Speed controls. The special Thump control acts like an intensity knob adding more warmth and allowing you to blend the pedal with your amp making it seem as if it were built in. The controls on the Galapagos allow you to get a subtle background wave for chordal color all the way to a thick, pulsing, on-off like chop. A super bright LED pulses with the tempo of the effect so, in a loop, you’ll always know what speed you have coming. In addition to a beautiful tremolo, the Galapagos also works as a smooth and dynamic volume booster. By turning the Depth and Rate controls all the way down, the Volume and Thump controls act like a signal booster that can be used to bump up a clean tone for solos or can be put in front of a gained out amp to help push it even harder. Simple versatility is the key to the Galapagos. It has plenty of tone shaping capabilities but at it’s core it has the heart of an old tube amp vibrato.